Has it Bean a While? If you can’t remember the last time you ate beans, you’re not alone. American’s consume three times LESS than what is recommended by the USDA for maximum health benefits. Diets including beans may reduce your risk of heart disease and certain cancers. Beans and other legumes are some of the most widely available, inexpensive and nutritious staple foods! A nutrient-rich food, beans contain protein, complex carbohydrates, fiber, antioxidants, and important vitamins and minerals, such as folate, manganese, potassium, iron, phosphorous, copper and magnesium. The lean protein in beans helps maintain and promote muscle while beans’ complex carbohydrates provide a sustained energy source. Bean cuisine can be very versatile and doesn’t have to be limited to bean soup. Beans can be prepared in breads, as a stuffing or casseroles! Cut a thin slice for the top of each pepper. Remove seeds. Cook peppers in boiling water for 3 minutes. Invert and drain. In a large skillet, cook ground beef and onion until meat is browned; drain well. Stir in chili beans and rice. Divide mixture evenly among peppers. Place peppers in a 2-quart baking dish. 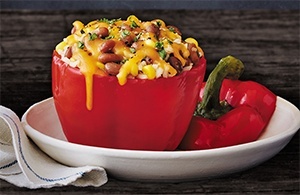 Cover and bake at 350 degrees F for 25 to 30 minutes or until peppers are tender.